UDOO is known for their ARM based development board with an MCU to control I/Os from Arduino compatible headers such as UDOO Quad or UDOO NEO. The community has now launched a new board called UDOO x86 powered by a quad core Intel processor, and integrating the Intel Curie compute module with Quark SE MCU used in Arduino 101, and the Arduino UNO headers. The basic version will come with Atom x5-E8000 Cherry Trail Braswell processor while the advanced version will feature Celeron N3160 Braswell processor. 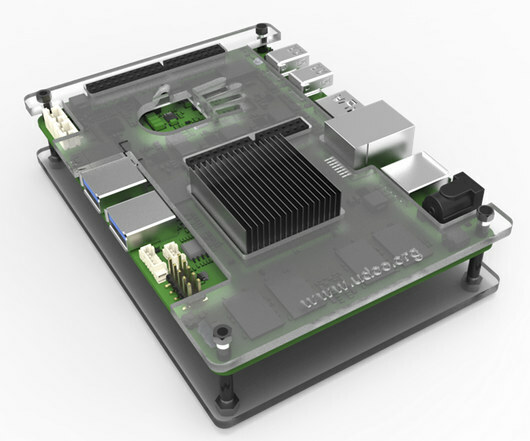 The board can run Android, Linux, and Windows, and support up to three 4K displays simultaneously. Bear in mind, that HDMI (and DisplayPort?) audio will most likely not work in UDOO x86 Basic, but should be OK in UDOO x86 Advanced (Finally both are Braswell part so HDMI audio could be working on both). You can program the Arduino part using Arduino 101 IDE running on the Intel part of the board just like you’d if you had a computer and a separate Arduino 101 board, except you’d known need to connect both since they are already connected via a USB interface. The 8GB internal storage only won’t do it to run Windows 10, but you’ll also be able to boot from USB 3.0, Ethernet, M.2 SATA or a micro SD card. The schematics (PDF), 3D design files, and the Bill of Material (BOM) will released under a Creative Commons CC BY-SA 3.0 license at the end of the campaign, as they’ve done previously with other UDOO boards. Pricing is also pretty good as UDOO x86 Basic is listed on Kickstarter for $89 (early bird), and UDOO x86 Advanced for $109 (early bird), after which the price will go up to respectively $109 and $129. However, the power supply, and various cables are not included, so you may want to check the kit instead ranging from UDOO x86 Basic starter kit ($114) with the board, a 12V/3A power adapter, an HDMI cable, SATA + Power cables, and the acrylic enclosure, to UDOO x86 Advanced performance kit ($169) with the board, a 32GB SATA III M.2 SSD, 802.11ac WiFi + Bluetooth module, the power adapter, an HDMI cable, SATA + Power cables, and an acrylic enclosure. Shipping adds $18 to anywhere in the world, and delivery is scheduled for November 2016. The advanced version is perfect for a micro but powerfull server (for a personnal use of course). what do you think? LOL, again a moronic sysbench ‘test’. When I ran sysbench on my UP board a few months ago I’ve been also surprised how fast the x5-Z8300 seemed to be. Just to realize that calculating prime numbers isn’t a benchmark any more since on these Atoms it’s the same as with ARMv8 SoCs: If you compile sysbench with optimised settings the benchmark scores simply explode. This has nothing to do with real world performance. here is Andrea Rovai, UDOO Team. I’d also like to point out that we haven’t recompiled anything. We have used the standard Sysbench that you can find in the repo, in order to get meaningful results and a common yardstick with Raspberry Pi and other single board computers. During the campaign we’ll post an update to dig deeper this matter. As you can see, Sysbench is very common in the field. @Andrea Rovai, UDOO Team: You have an interesting product, but too bad that you only appear to offer a UEFI/BIOS in blob form. This severely limits this product’s usefulness for open source development. Additionally, it looks like that bootup blob is loaded from a hard-soldered flash chip. You should rather use a socket in its place on the board. See http://www.larsenassociates.com/Chupondpages/FlashSocket8-16.html for a nice solution, which I found in use in Shuttle’s recent fanless barebones and which I consider a very good and space-efficient solution, or https://www.flashrom.org/Technology for sockets used in older mainboards. This cannot possibly add a lot to production cost (you could even require buyers to insert the flash chip themselves upon receipt of their boards) and would make a realistic stretch goal. For me, it would make the board much more interesting. Next step stretch goal should of course be the provision of open source board initialisation software. Lastly, let me suggest a third stretch goal idea: a battery connector (to power the board, i. e, in addition to the RTC one). Many SBCs have one and it would provide an interruption-free power supply to the board even in places with frequent power outages. I know that RPi foundation uses ONLY questionable benchmarks but that doesn’t matter. Calculating prime numbers can be used as a rough performance comparison if you just compare a couple of ARMv7 boards using the very same sysbench binary. It’s not possible to compare different architectures using sysbench since the results are highly misleading. The UDOO is faster than an RPi 3 without questions. But not based on this sysbench crap but more importantly due to better overall ‘real world’ performance and better connections to the outside (limited on RPi 3 still to one single USB 2.0 connection). sata, gbe, 3x usb3, powerful soc. no csi?, no usb otg? november 2016! about otg i dont known if e8000 has one, but e8000 has csi and this board just haven’t connector, maybe because the big brother n3160 havent one. 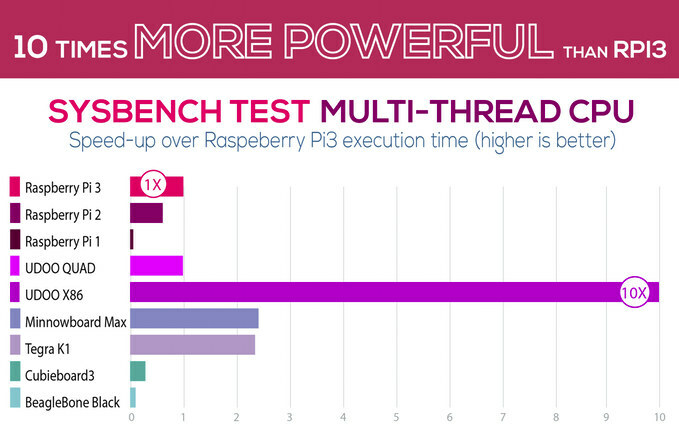 sysbench is ok, but i think its 2x-3x performance of minnowboard in average, so it can be a peak, but not maybe not general use performance, please try to add more test for cpu but also gpu, in android(when available) and linux. wait to november? to much for me… maybe a aditional board if android/retroarch performance is super. thanks cnxsoft for good news.